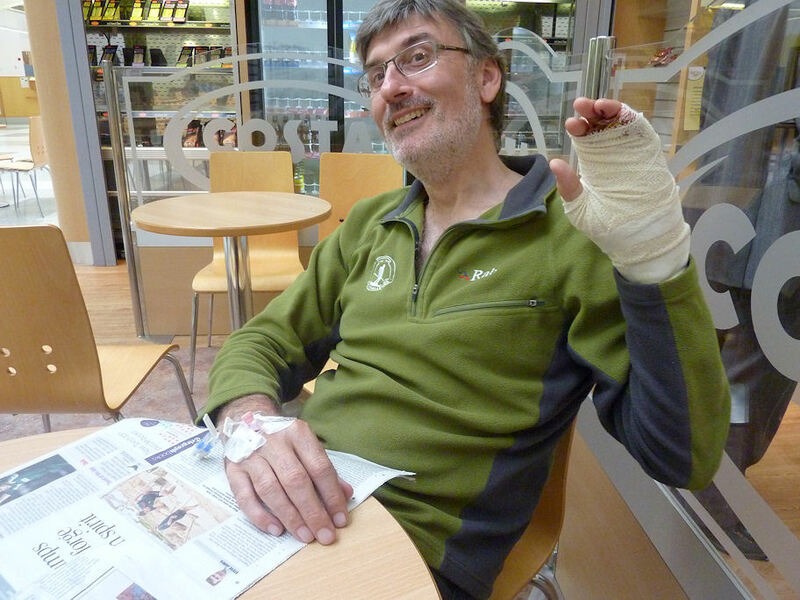 Well, the plot continues to thicken in relation to Alan’s bashed hand. The doctors in Carlisle have decided that Newcastle is definitely the place for him, as they have micro-surgeons there who patch up severely bashed hands every day. He’s in Carlisle hospital again tonight, but tomorrow morning he’s going to be conveyed to Newcastle in a swarm of flashing blue lights, to be seen in the Hands and Plastics Trauma Clinic. I’m v. much hoping that they’ll go on and do the business surgically tomorrow, before the bits that were hanging off yesterday afternoon give up the ghost. A continues to put on a brave face. Mind you, with a face like that I suppose he’s had to learn to be brave! Seriously, though, he’s very stoical. I confess that I’m amazed. I’ve seen no sign of this stoicism before now. Just touch him accidentally and he jumps as though he’s been kicked! When important bits are hanging off, though, it seems that he can grit his teeth with the best of them. He’s doing much better than I’d have done: that’s for sure. The clinic appointment is at 11am tomorrow morning, and it’s not yet clear whether he’ll be able to have his hand sorted and leave hospital later in the day. My instinct is that he’ll still be in Newcastle hospital tomorrow night, though, and if that’s what happens then Piglet and I hope to take him home to Cambridge the following day. But until after the clinic appointment we’ll be playing things by ear. I see that the wounded warrior has dragged his uninjured crubeen to his mobile to respond briefly to some postings here and on Martin‘s blog. He can’t do much with just one hand, though, and when I told him about all y’all kind messages earlier in the day he was very chuffed. This entry was posted on Tuesday, September 28th, 2010 at 10:06 pm and is filed under Alan's hand. You can follow any responses to this entry through the RSS 2.0 feed. You can leave a response, or trackback from your own site. Good luck tomorrow Alan old chap. Hope to see you guys when you are back down in the Fens. By the way, my Mum is a bit better, but they are keeping her in for a couple of days. The link from your comment on my blog does work. Hopefully some serious inroads into sorting out the bashed hand can be made tomorrow. Good luck. Hope it goes well today in Newcastle, Alan. Shirl’s detailed picture of the gore was far too graphic and I was forced to drink a beer for you! All the best. We’re thinking of you. Best of luck with the op and hoping for a speedy recovery. I’ll be up in the Lakes next week assiduously avoiding barbed wire! Good luck in the Lakes. I’ll cross my crubeens for some decent weather for you. It’s peeing down here as I type, though. OMG – it wasn’t just the hand he caught then? So it’s not only the hand that needs plastic churgery ? 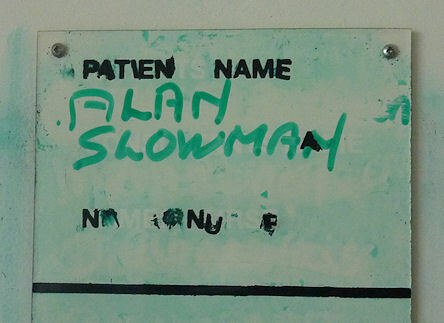 Best of luck, Alan, and a speedy recovery ! Gayle and I have been following the developing story on the blog with mouths agape. 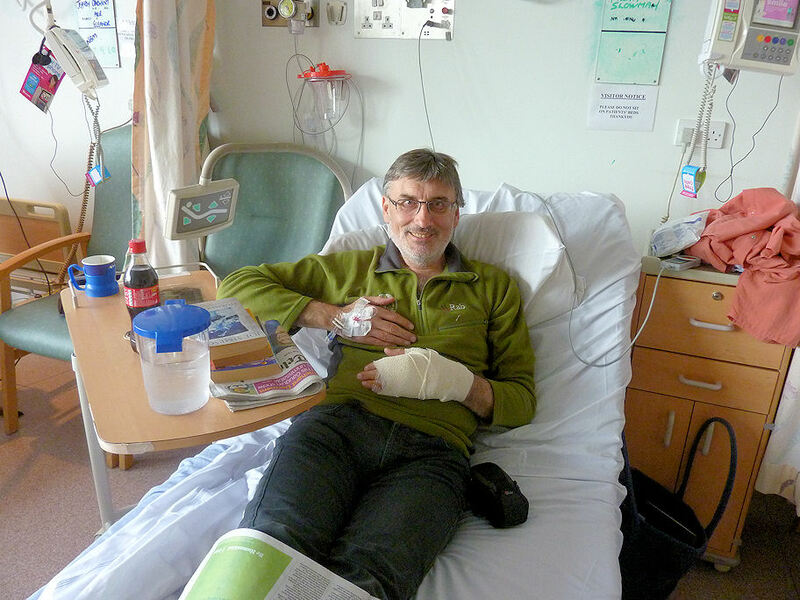 Give our best wishes to Alan and we hope for his speedy recovery and return to the hills. Once Gayle manages to get out of this working habit she’s fallen into, we’ll try to meet up with you all again. TGOC entry is in, so fingers crossed. PS Originally posted this on Martin’s blog – I’m getting confused in my old age.